Elmo Freech (Piper) is a rough-and-tumble Private Investigator and ex-cop who does things his way. He ends up teaming up with a mysterious man who has lost his memory, John Portland (Blanks). But Portland appears to be a trained fighter, and together the two men - who certainly don’t always see eye to eye - get deeper and deeper into a conspiracy that goes all the way to the top. They’re going to have to work together and fight to get to the truth. Can they do it? 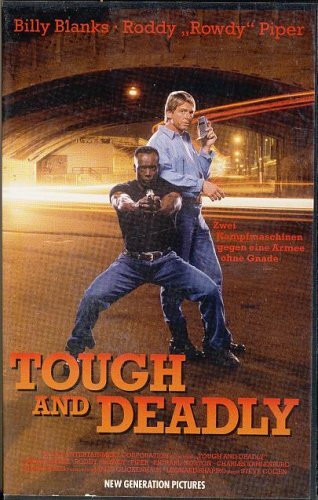 Tough and Deadly is classic 90’s fun at its best. One of its main strengths is its healthy dose of humor. So many movies out there, DTV actioners included, take themselves so seriously - finally, here’s a movie with the guts to not take itself so seriously, but also has some killer stunts and fights, which are taken seriously. So it strikes a near-perfect balance of tongue-in-cheek, well, cheekiness, with some nice bone-crunching action. It’s a surprisingly rare mix, so our hats go off to the filmmakers on this win. The movie really gives you what you want: on top of the humor, the stunts, fights, etc., it has a very good pace and nice energy. You can actually SEE what’s going on. Nothing is shrouded in shadow. 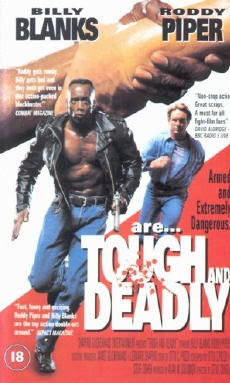 Considering there’s a barfight AND a poolhall fight, as well as a (completely inexplicable) training sequence followed by a montage, Tough and Deadly truly has it all. Let’s not forget the Billy Blanks and Richard Norton fight, which gets the movie off to an engaging beginning. There’s also the classic “I want to listen to country!” “I want to listen to rap!” CD player confrontation between Freech and Portland. Just the names of the characters are insane - Elmo Freech, Winston Briggers (Karen), Trekkler, and Freech’s assistant Maureen Peek (Stahl). Yet, the great Richard Norton plays...Agent Norton. Does he feel cheated that he didn’t get a wacky name? At least he’s on board. That’s all that counts. Naturally, it all ends in the time-honored abandoned warehouse. Also Elmo Freech has a poster in his house that simply says “Pasta Sauce”. For his interior decoration skills alone, you should see Tough and Deadly. It’s easy to see why Piper and Blanks teamed up again after Back In Action (1993). Piper’s charm and Blanks’ woodenness make an excellent combination. It’s sad that they didn’t team up on any more movies after this. But at least we have two. While debate continues to rage as to who - John Portland or Elmo Freech - is Tough and who is Deadly - there’s certainly no shortage of face-punching action in this prime example of what the 90’s Direct-To-Video era could do. Also check out write-ups by our buddies, DTVC and Cool Awesome Movies! Thanks! This is 90s action and Roddy at their best. Gotta love Elmo and Quicksilver! 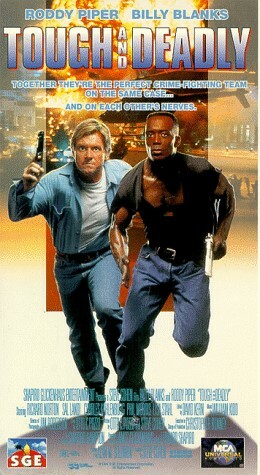 Solid action movie starring three of the greats: Piper, Blanks and Norton. Beware the cut UK version. Shapiro Glickenhaus Entertainment made some great movies. Can't agree more. This was a blast to watch. Happy it got made. We have the U.S. version...what does the U.K. cut out? The UK version was pre-edited, by the distributor(?). The BBFC would probably have cut it anyway. Two minutes of martial-arts violence was cut. Damn those censor-happy Brits. They really hate martial arts violence...heard they cut a scene in TMNT 2: Secret Of The Ooze that depicted nunchucks as sausages.